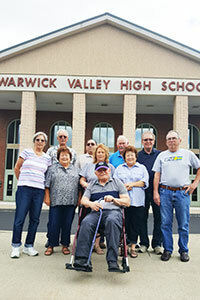 WVHS Class of 1967 50th Reunion 2017 – WVHS Tour Front row – Miguel (Mike) Escobar Second row (from left) – Judy Glorie Doty, Mary Rita Williams Schlagel, Regina Conklin Ball, Elizabeth Williams VanEtten and William (Bill) Doty. Third row (from left) – Michael Bonnema, John Schlagel, Glenn Wood and guest Richard Ball. The WVHS Class of 1967 hosted its 50th Class Reunion on the evening of Sat., August 5 at the Warwick Valley Country Club. The event began with a cocktail hour, followed by a buffet dinner. Music was provided by DJ Mike Escobar. Additional reunion weekend events included an informal meet and greet at Pennings Farm Market on Friday, a guided tour of Warwick Valley High School on Saturday, and a Sunday Brunch at the Iron Forge Inn in Bellvale.